When we changed our diets and gave up several categories of staple foods, the consensus was that we were going to starve. The pictures above feature the makings for a typical meal at our house. Chicken with mushroom sauce is a favorite. We serve it over spaghetti squash. My husband has to fight for a leftover for his lunch at work. So, how do I obtain a cream sauce without using milk? See the measuring cup of cashews in the upper left-hand corner. There is the secret. I use a cup of cashews with a cup of chicken broth and heat it up in the microwave for a minute to heat up the broth and help the cashews soak it up and soften a bit. It goes into the blender with seasonings of choice, a half tablespoon of Arrowroot starch (you can use cornstarch, too), blend it smooth and put in a pot. Bring to a simmer, stirring often. If it is too thick, add more broth, too thin a bit more of your chosen thickener dissolved in a tablespoon of water. Meanwhile, brown your boneless chicken really well. Cool a bit and slice into bite-sized pieces and set aside. Do NOT wash your browning pan because now you are going to brown your onions (add a bit more olive oil if necessary) and the sliced, fresh mushrooms. 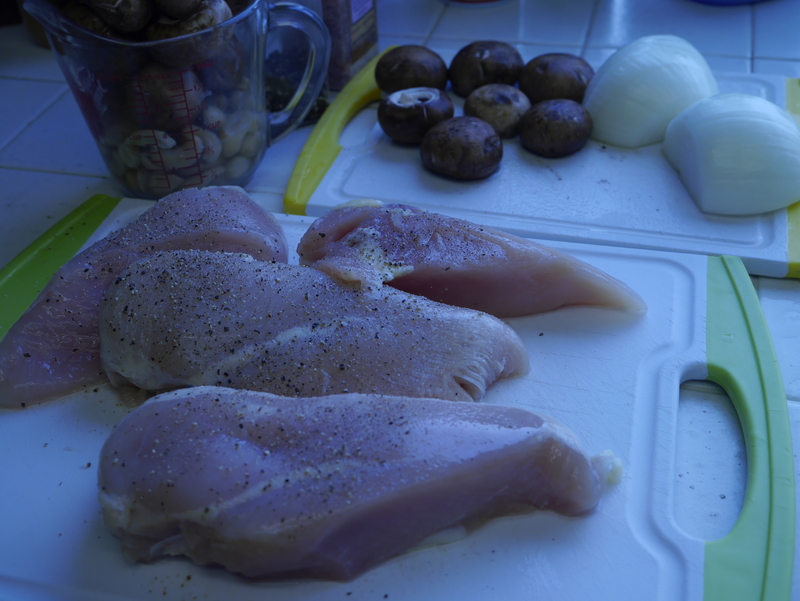 Return the chicken to the pan along with your sauce and bring to a simmer, turn down the heat, and let the flavors meld. Test for seasoning adding more salt and pepper, if needed. I like to put a sprinkle of cayenne into the sauce but not for heat but to perk up the taste. The greenery in the second picture is Kale which has become a favorite around here. For a meal with a sauced protein, you need a contrast and this is an easy one. Wash your Kale and strip off big pieces of the woody center. Put the Kale pieces in a large bowl and add two smashed and diced cloves of garlic along with salt, pepper, and a tablespoon of sesame seeds. Toss with half olive oil and half sesame oil. 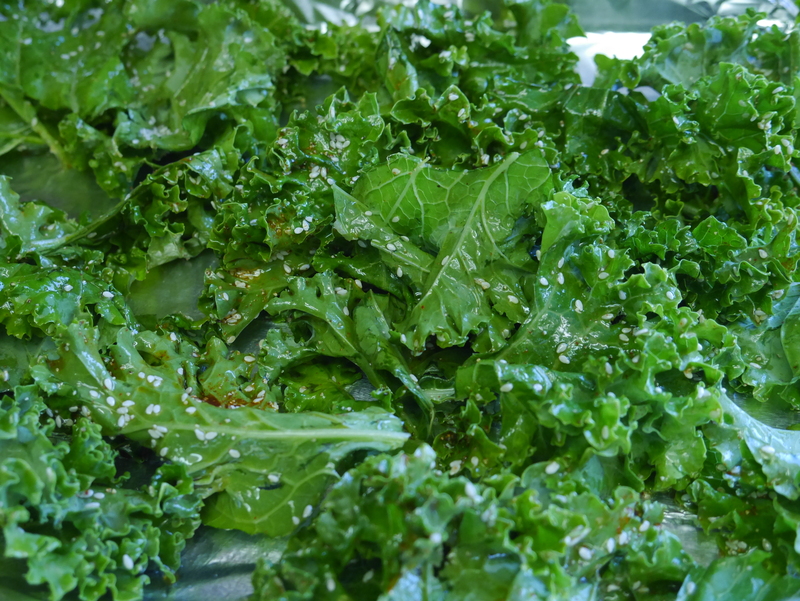 You want the Kale to glisten not drown in the oil. Lay out the Kale on a foil lined baking sheet. Bake at 350 degrees for about 15-20 minutes depending on your stove. The leaves will begin to brown a bit and be crisp. Spaghetti Squashes only challenge is in cutting the thing in half! I find that buying two or three small ones is easier as they are more tender than the large ones. In any cash, cut a thin slice off each end to form a flat surface to cut them down the middle, lengthwise, Scrap out the seeds and put them cut side down in a baking dish. Pour in enough water to come just a half inch up the side of the squash. Put in the microwave and it takes approximately 15-20 minutes to get tender. Remove from oven and with a wad of paper towel to keep your hand from getting burned, use a fork to scrap out the spaghetti-like strands. Dinner is served and I guarantee no one will starve.